Dumped by his girlfriend René, comicbook fan Brodie has gone to the mall with his friend and fellow dumpee TS to take his mind off of things. But when they see that TS's ex is filming a new dating show at the mall, the pair enlist the help of local criminals Jay and Silent Bob to sabotage the event. Ah, malls: remember when those were a thing? Brodie Bruce is Randal Graves' cousin, and has the same smarmy attitude. 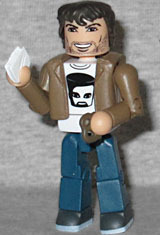 He was played by ex-professional skateboarder and future secret scientologist Jason Lee in his first film role, and the Minimate's likeness is superb - way better than the InAction figure. The head has painted stubble and a big fake smile, and there's no mistaking who it is. The set also includes a frowning face, but the smile is better. The distorted face on his T-shirt (a composite photo of the other actors who auditioned for the role) has been "Minimatized," which is a nice touch. He's wearing his brown jacket (which should be darker/more red), and has an extender for the lower edge of his shirt. His accessories are a small white bag and a single chocolate-covered pretzel. Brodie's girlfriend René was played by Shannen Doherty, who has had a toy before, thanks to a line of 90210 dolls from Mattel. Despite the fact that Mallrats takes place over the course of a single day (the day before Clerks) René wore multiple outfits through the film - Doherty had a clause in her contract that she was allowed to keep all her costumes. 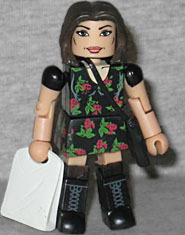 This figure is wearing the flowered dress seen on the film poster, with black boots and tall socks creating a little absolute territory in between. The likeness isn't much to speak of - just "generically attractive female" - but that's fine for her. She comes with a black purse and a white bag to show that she's been shopping. Jay is a fairly iconic character, but the studio insisted that Kevin Smith recast him. So in some alternate reality out there, there's a version of Mallrats featuring Seth Green or Breckin Meyer. 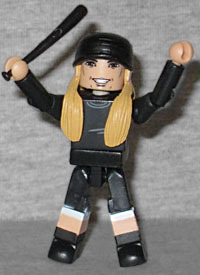 This figure uses the same stocking cap and long blond hair as the first Jay Minimate, but this is my first time getting it in color. His clothes are mostly black: the hat, a long-sleeved shirt, black shorts with a second pair of white shorts poking out the legs, and black combat boots. The big smile and the fact that the hat comes down low over his eyes makes this the Jay-iest Jay yet. He comes with a black baseball bat, from back in the days when Kevin Smith was the only person who remembered the "kneel before Zod" line. 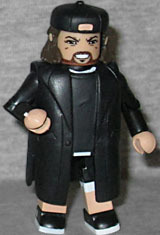 Speaking of Kevin Smith, this Silent Bob is pretty the same as every other Silent Bob, at least in terms of add-ons. They've all had the same coat, they've all had the same hat/hair, and they've all had the same hand with a cigarette (meaning two sets came out the same week that both featured that piece) - the specific details are just left to the paint. Like Jay, Bob is wearing mostly black, though he's got high tops rather than boots. The face this time is painted to look very angry, a.k.a. his "honing his Jedi powers" look. He has no accessories - they could have given him the "bat ears" head Bluntman came with, since that look originated in Mallrats. Hopefully this won't be the only Mallrats set we get: they could easily do TS, Brandi, Mr. Svenning and LaFours (or even Stan Lee! ), but even if they don't make a second four-pack, this one is pretty cool. This entry was posted in Art Asylum, MMMR and tagged Minimates, View Askew. Bookmark the permalink.